we have been working hard, to run the shop! Please lit five stars evaluation for us, as a reward, Have a nice day. Hi, Friends, more surprise are waiting for you. Please click the link soon. 3.In most times item will reach most of the countries within 8 to 15 working days. To some remote areas may take more than 20 working days. 4.If you don't receive the item after 30 days, please contact us, we'll investigate and solve the delivery problem. 2. We usually mark the goods as media player/computer accessory(GIFT/SAMPLE) on the commercial invoice and we are trying to help to minimize or avoid any GST or V.A.T or other Import taxes, but we cannot guarantee no tax charges as it is depends on your Country?s Import Policy. 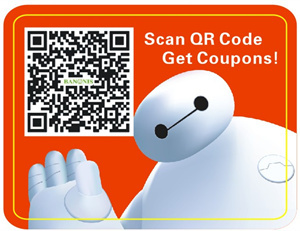 Please scan the QR code, Favorite Stores become VIP members get 5USD, 10USD, 20USD coupons!